Thorn Park on the island is located at Penneshaw on Kangaroo Island, one of the state’s most popular and spectacular tourist destinations. Thirty minutes by plane or a forty-five-minute ferry trip from the mainland of South Australia. 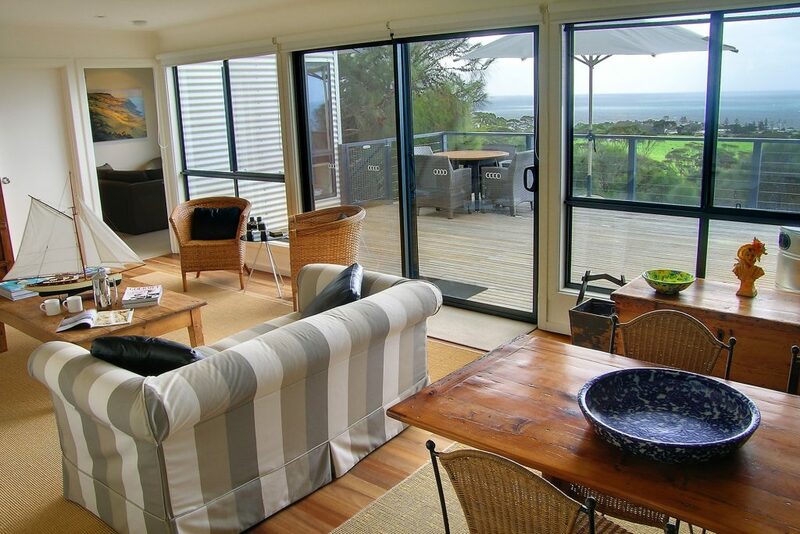 A contemporary three-bedroom beach house, the property is located on the hill looking over the town and harbour of Penneshaw. 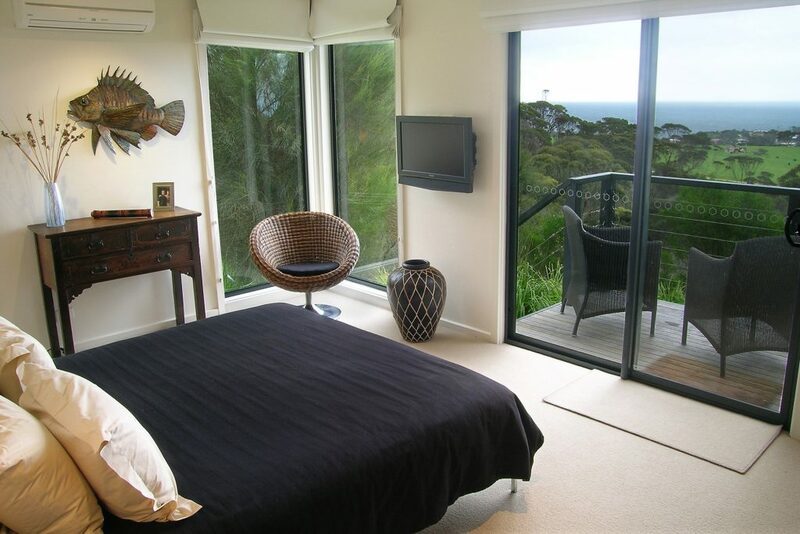 The house is light and bright with large north facing windows that provide an expansive view of the ocean, township and countryside. 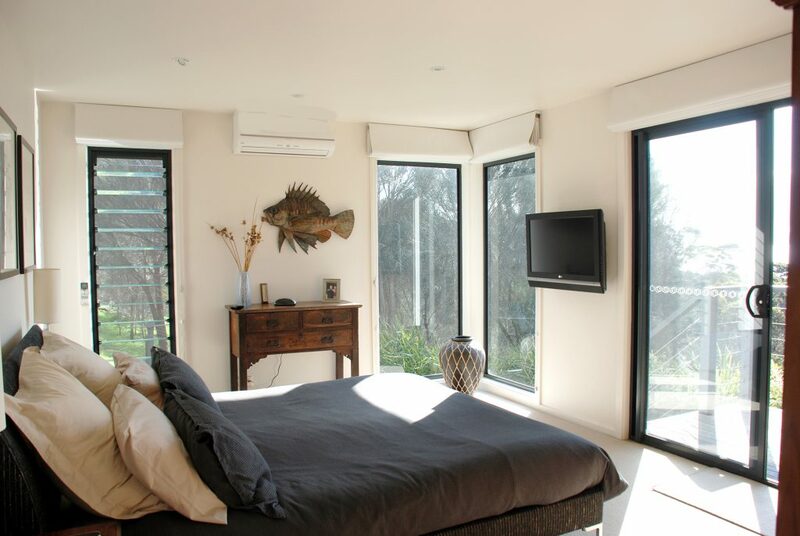 The property is furnished with high quality furniture and artworks, but maintains a relaxed and comfortable ambience.The homes surrounding three acres of bushland is home to numerous wallabies, kangaroos and the feeding grounds to the rare glossy black cockatoo. Thorn Park on the island is suited to groups of two to six people. Children are welcome and the property is safe for families. 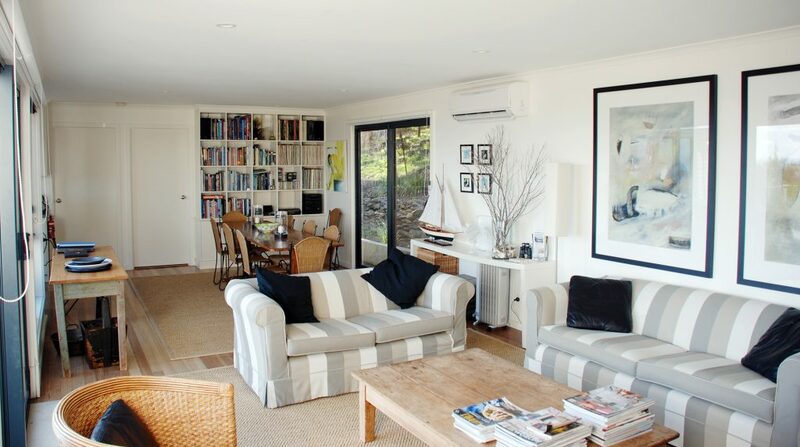 The large open plan sitting and dining room has comfortable couches and armchairs, and opens onto a large deck overlooking the ocean and small harbour where the ferry from the mainland arrives. There are televisions, video, DVD players, CD player and a large selection of books, DVD’s and games. The house is connected to the NBN internet and Telstra TV is also available. The kitchen is equipped with microwave oven, dishwasher, European fan forced electric oven and ceramic cook tops. There is a full selection of pots and pans and most equipment needed to prepare and cook with. The pantry cupboard has all the basics of herbs, spices, oils, sugar, flours etc., that you may need for cooking. We only ask that as items are used up, could they be replaced if possible. The local supermarket in the village is extremely good and is open 8am to 8 pm daily. There is a large gas kettle style BBQ and a gas heater on the deck and a large market umbrella provides shelter on a hot day. There is also a grassed area overlooking the ocean. All rooms are equipped with woollen & cotton blankets, doonas and quality beds and pillows.The main bedroom has a king-sized bed and access to one of the bathrooms. 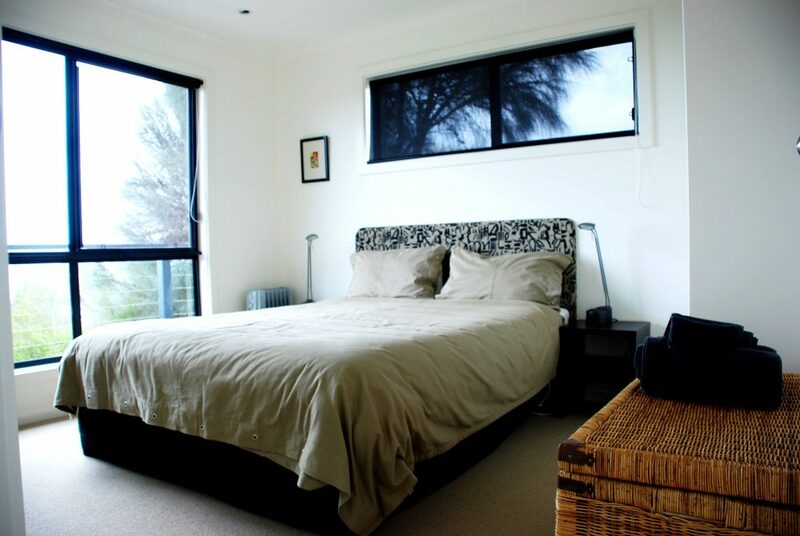 The other two bedrooms have queen-sized beds (one can be twinned). The house has two bathrooms, one adjacent to the main bedroom with walk-in shower, large vanity and toilet. The second bathroom has a shower/ bath, vanity and separate toilet. We provide towels soaps, shampoos, toilet paper, tissues and emergency supplies as well as a first aid kit. There is a laundry with a front load washer/dryer and there is a clothesline. With the exception of all Australian school holidays, Thorn Park on the island is available for a minimum three day stay. A minimum one week booking is required for school holidays (Friday to Friday) . Maximum of six persons staying at any one time – a surcharge will be made for larger groups. A deposit to the value of 25% of the booking is required at time of booking. Final payment must be made four weeks prior to arrival date. Reservations are not confirmed until we receive a deposit or a credit card number. Deposits can be paid by credit card, cheque or electronic transfer. Payments may be made by cash, cheque, EFT, PayPal or by credit card via the Thorn Park terminal. A credit card number is also required for security against damage. Unless Thorn Park by the island is re-booked, deposits will not be refunded if a reservation is cancelled up to 30 days prior to the arrival date. telephone — national 08 8843 4304 international +61 8 8843 4304 or using the email link below. Please check the availability calendar (above left) beofre making a reservation. Address, map and information about Kangaroo Island are supplied after the booking has been confirmed. “Jean”, our housekeeper on the island, will have everything ready for your arrival, and she cleans after your departure. The house is prepared for your arrival with the correct number of beds made up, and bath towels provided. ADDITIONAL cleaning (at the guest’s cost) can be arranged for longer stays. Please ensure that the house is left tidy and all dishes etc. have been washed and rubbish placed in the external bins. Thorn Park on the island has consistently delighted our guests for its superb location and relaxed, elegant beach house style. Very well equipped including and extensive library, return visits are frequent. Owners David Hay and Michael Speers’ thirty years in the business of hospitality has not in any way dulled their professionalism. If anything, over the years, they have honed and perfected the experience over all of their properties. 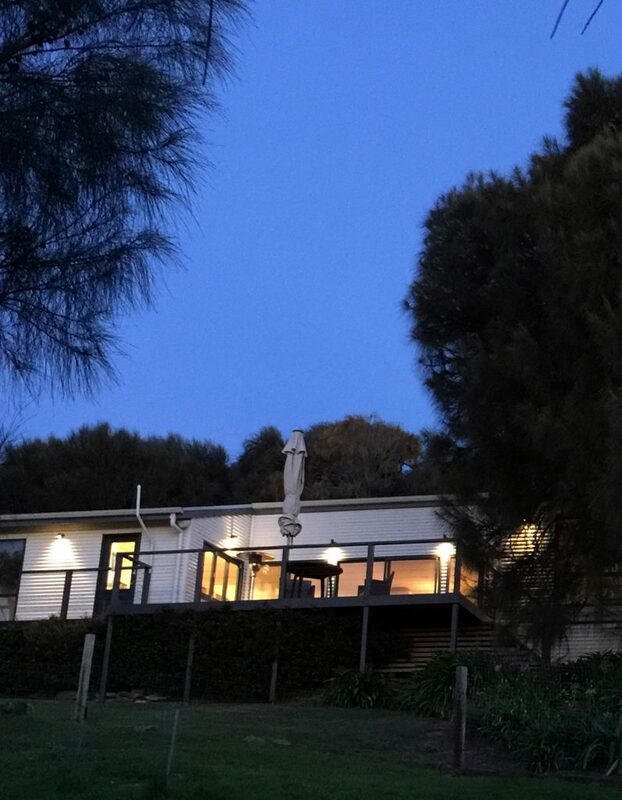 We have three brilliant properties, Thorn Park by the vines, Thorn Park in the city, located in inner city Adelaide, South Australia and Thorn Park on the island, located on South Australia’s pristine Kangaroo Island.